This Post Is In Partnership With the official Revamp Restyle Reveal sponsors as listed at the bottom of this post. 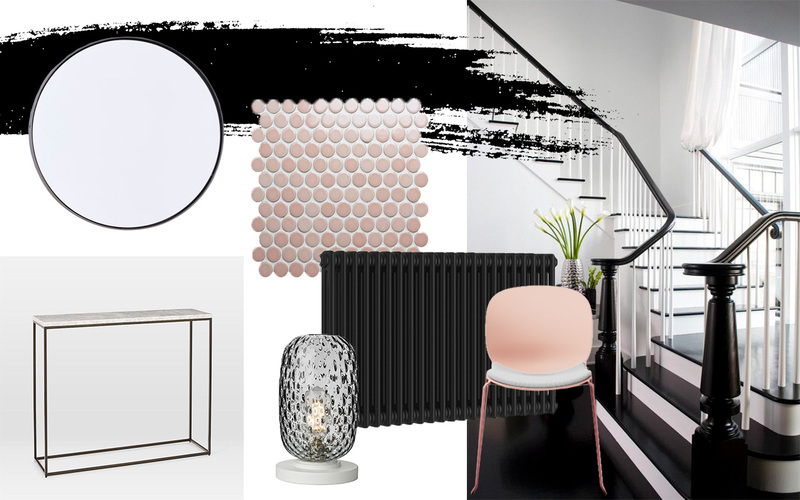 If you’ve been following along over the last month then you will know that I have been taking part in the interior design challenge that is Revamp Restyle Reveal. What is it? 10 bloggers have 4 weeks to makeover one space in the home with the help of a bunch of amazing sponsors. If you’re joining me from Luke Arthur Wells and his insane office makeover then Hello and thank you for joining me and you can hop to the next blog at the bottom of this post – please do because I can promise you that each and every one is incredible! You can check out our weekly progress videos here if you want to catch up, but it’s done! We’ve completed it! We can tick Revamp Restyle Reveal Season 3 off our ticklist and I’m so happy with the result. We gave our hallway and landing a drastic makeover in just four weeks – with the amazing help of our sponsors of course! The overall aim of this makeover was to take our hallway from boring and basic (okay it wasn’t that bad – before photos are towards the end of this post, but I wanted to put my own stamp on it) to a powerful, ‘wow‘ monochrome entrance! I wanted to prove that there’s a lot you can do with a small narrow space such as this, since so many of us do have awkward slim hallways don’t we? So let’s get to it shall we? Where do I even begin? Perhaps with my favourite part of the entire makeover – our hallway tiles. Ca’ Pietra have the most incredible range of tiles (including pink terrazzo which I very nearly went with), but I’m beyond pleased with how the Yoga Penny Porcelain tiles look, we used a mixture of the blush, the white for the border and the tempest grey for the words… ahh yes, the words! ‘YOU LOOK GOOD’ was a very last minute decision, Matt had tiled half the hallway and told me that if I wanted to write anything that I needed to say now. I used one sheet of the tempest grey penny tiles (we had a sample sheet from the beginning of the project) and this is what I came up with under pressure! Who doesn’t need a positive pick me up every day when they get home? Oh and some people have already asked so it’s probably worth mentioning that our floor before was vinyl so we just tiled straight on top of that. Previously we had a shoe cabinet in this alcove but I really wanted to have a more simple storage solution for our coats and shoes. We added a simple shelf above the skirting board for shoes along with this beautiful pom pom basket from West Elm for hiding more shoes away and then we made a simple hanging coat rail using a curtain pole, some rope which we painted black, ceiling hooks and S-hooks to hand the coats! Cheap to make and yet it looks really effective. Hello minimalism. Paint played a huge part in this makeover, the hallway doesn’t get much natural light so it was really important to try and brighten the hallway whilst incorporating the statement black which I so badly craved using! For the walls we used Zoffany from Style Library Arctic White emulsion, which is an ever so slightly blue toned white, sort of a very very pale grey. For the black stripe we used Zoffany from Style Library Bone Black emulsion. I gave all the skirting, door frames and stair edging a freshen up with Zoffany from Style Library Perfect White water based eggshell (I kept saying acrylic based in the video for some reason, sorry) and for the stairs themselves, the banister and the doors I used Zoffany from Style Library Bone Black water based eggshell. I have been advised to seal the stairs on top of the eggshell paint, which I am yet to do, but I have to say, so far so good – I’m really impressed with the quality of the paint, I thought after a few weeks of us going up and down the stairs that they may have chipped in places, but so far there’s no wear and tear at all! Our beautiful new radiators (and fancy valves) compliment the space and new style perfectly! These are Soak.com’s newest radiator range, their black column radiators. I’ve said it before and I’ll say it again, column radiators really are so worth it – it’s obvious that they transform any space since they are just so gorgeous but I’m still always impressed by how much heat they pump out and so quickly too. Our hallway has always been quite cold but already we have noticed a huge difference. Hooray for column radiators. The sexiest radiators known to man. Yep, I said it. Our beautiful new round hallway mirror is from west elm and it’s looks exactly how I pictured it would on top of the black stripe, just how I visioned it in my head! Teamed perfectly with their industrial storage mango console table – pretty and practical, because we all need somewhere to throw our keys down at the end of the day, and it’s so slim that even in our narrow hallway it doesn’t look out of place. I’ve styled the console table with a few of west elm’s other stunning accessories, geometry book ends, totem vases, foundation bowls, foundation vase, and another pom pom basket for extra storage. The stylish plant pots and house plants are from the wonderful land that is Dobbies Garden Centre… more plants coming up… you know how much I love my house plants, tending to my house plants has definitely become my hobby of late so I’ll be back at Dobbies very soon. Having a console table meant I could finally have something in the hallway that I have wanted since I moved in five years ago… a lamp. I know that sounds stupid but we never had anywhere to put one before and as I mentioned before, the hallway can get quite dim so I’ve always wanted a lamp on a timer so that it’s not completely pitch black when we get home at the end of the day. Cue our gorgeous new David Hunt Lighting Vidro Smoke Table lamp (Size small). It’s a beauty itself isn’t it?! I was so, so delighted when Sonos were announced as one of our sponsors this season, I worked with them on a campaign last year and since then I have bought another of their speakers, and for good reason. I just cannot gush enough about how brilliant the speakers are! The sound (in our opinion) tops any other branded speakers we have had before, but that’s not all – you can link different Sonos speakers up so you can play music throughout the house or just in particular rooms. Oh and they have Alexa built in, what more could you want in a speaker really? I’m also a big fan because the Sonos One speakers aren’t big and they aren’t ugly – in-fact they don’t even really look like a speaker, they just look like a sleek object, they have interior design in mind. Having this in the hallway has made hours on hours of watching paint dry much more entertaining! Another shoutout to ao.com for ever so kindly providing us with the new Dyson Hot + Cool Air Purifier I can’t tell you how much use we will get out of this over the years to come, both in winter and summer, but with it being an air purifier too it has so many other health benefits too – we’ve had it on so much in the last few weeks to help with all the paint fumes! It has a 360° filter which removes odours, gases & 99.95% of allergens! I decided on these dainty sculptural glass globe ceiling lamps from west elm for both the hallway downstairs and the landing upstairs, they do come in a larger size but these actually surprised me – they are the perfect size for the space without being too overpowering. Onto the upstairs… painting the banister made such a huge difference, I’m so pleased that we did that. It’s amazing what a lick of paint can do! Now whilst the painted floorboards (Zoffany from Style Library Perfect White Acrylic Eggshell) aren’t permanent – we are actually getting carpet fitted in a few weeks time in our bedroom and the hallway will be carpeted with the same carpet… but for the interim, I actually love how the floorboards came out once painted. I know they’re not perfect, there’s holes and gaps but I think it just adds a bit of character, I’m a fan anyway! If we weren’t getting carpet in a few weeks, I actually wouldn’t mind at all! This is our new gorgeous statement Flokk RBM Noor Chair! For obvious reasons I went for pink… pink really pops against black though doesn’t it?! Seriously though, if I could marry a chair, this would be it. Their chairs are completely customisable so you can pick what colour, what fabric and so on… 14 shell colours, unlimited fabrics and various leg options! Plus sustainability is a huge part of Flokk’s ethos, the RBM Noor is made from recycled and recyclable materials which is amazing. Similarly to downstairs I really wanted a floor lamp upstairs (since we don’t have space for a table on the landing) to have on a timer to add a warm glow to the landing in the evenings. There’s not much going on on the landing so this west elm sphere and stem floor lamp really stands out, it’s a statement all on its own. It really makes the gold light switches pop from the walls too, it’s all the little details! Speaking of little details… I’ve been on the hunt for this exact style foundation vase for months now so I was so pleased to get my hands on this vase from west elm – the perfect partner for my pampas, if I do say so myself! I didn’t want to overdo it with stuff on the walls since the stripe up the stairs is quite a statement in itself but I wanted to add something simple to this bare wall and the monochrome gallery frames from west elm were just the thing for creating a sleek gallery wall. And those prints come inside the frame would you believe it?! I added another black framed round mirror to the landing too in the hope that it would bounce a bit of light and help brighten the space up – this beauty is the iris round mirror from soak.com and it’s a complete statement piece. It’s a huge mirror and the rim makes it even more of a wow piece. I just adore this mirror. It would look amazing styled in any room in the home! And for a true appreciation of what we achieved over the four week challenge… here’s the before photos! Please do take the time to check out all of the other bloggers #RevampRestyleReveal makeovers – I promise you that you will be astounded at what they have achieved. Each makeover is so unique, so much effort has been made and I take my hat off to each and everyone involved in this season! They are a hugely talented bunch! Next up on the blog hop is Matthew Shaw and his Master Suite – incredible work! A huge, huge thank you to all our sponsors for helping make Revamp Restyle Reveal and our hallway makeover possible! Absolutely gorgeous Olivia! Always doing such a breathtaking job. Can I ask where your pampas are from? Ahh it looks amazing! Love the monochrome look!